Miguel Escobar Varela, has always been interested in theatre. Combining his passion for theatre and computer programming, Miguel – who also teaches a module UAR2207 Theatre and the World under the University Scholars Programme – decided to embark on an unconventional research project on Javanese Wayang Kulit using Digital Humanities. The product of it is an interactive online dissertation that had bagged the Wang Gungwu Medal and Prize for the Best PhD Thesis in the Social Sciences/Humanities at the recent FASS Awards Ceremony 2015. He shares with us the reasons behind his decision to pursue Theatre Studies and discussed the crux of his dissertation. 1) Why did you choose Theatre Studies? I’ve always been interested in theatre as a way of understanding other cultures. I have been fortunate to live in different countries and theatre has always provided me with a unique mode of learning about other ways of looking at life. Theatre is about interactions: between people, between artistic forms and between ideas about the past and the future. I wanted to study theatre because I think it provides a fascinating insight into the way people think about themselves and others. 2) How has FASS and NUS contributed to your journey thus far? The Faculty of Arts and Social Science at NUS has been a great place to study. As part of my PhD research I was able to be part of other research projects, to teach things I’m passionate about and to go on field trips to Indonesia, which was a fundamental part of my research project. I was very happy to be able to talk to researchers from other fields and attend talks by experts from many different places. I also had access to great resources at the library. Overall, it was the perfect place to conduct research, share it with others and get feedback. It’s great honour. The dissertation was a combination of conventional theatre analysis and Digital Humanities (computational methods for the study of culture). The dissertation itself was submitted as an interactive website which includes a combination of diagrams, videos and texts. The methods and presentation format of the dissertation are relatively new, and I feel very encouraged by the fact that NUS chose to give the award to an unconventional, interdisciplinary dissertation. 4) Tell us more about your thesis. What is the crux of it? 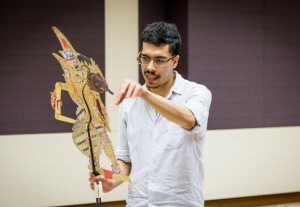 The thesis speaks about new developments in the Javanese tradition of wayang kulit (leather puppet theatre). It is a very respected tradition but few young people watch the conventional eight-hour performances nowadays. However, many innovative dalang (puppeteers) have incorporated elements from popular culture and digital media into their performances in order to speak about socio-cultural change in Java. This performances are called wayang kontemporer [contemporary wayang]. For example, there is a performance which combines traditional narratives from the Mahabharata with Hip Hop music in order to explore inter-generational conflicts. My thesis was the result of a systematic study of wayang kontemporer performances that triedto identify patterns in the way the artists combined tradition and new media, and in the socio-cultural challenges they addressed. Even though the performances might seem similar at first glance, the study showed a wide spectrum of creative strategies and a very diverse range of attitudes towards topical concerns in Java. The thesis, in its interactive form, is now available at wayangkontemporer.com. The portal includes interactive diagrams, videos and the full text of the thesis. Users can also leave comments and I look forward to more feedback on this project. 5) What inspired you to conduct research in this particular area? I first went to Indonesia many years ago to study the languages and performance traditions of Java. I knew a little bit about conventional wayang kulit and I thought it was a fascinating tradition. While I was in Yogyakarta, I happened to see a show that combined traditional puppets, actors and complex stage machinery with special effects. I had never seen anything quite like that and I decided to learn more about it. There were only a few books and articles that mentioned wayang kontemporer but I could not find any comprehensive study of these innovations. So the idea of starting a documentation project stayed with me and, a few years later, I decided that the best way to purse this was through a PhD project. Besides theatre, my other great passion is computer programming. I wanted to find a way to combine both theatre research and programming in my research. I started to read more about the emerging field of Digital Humanities, where researchers are often also programmers interested in using computational methods to study culture. This provided me with inspiration to continue with the project, which eventually became the interactive, online dissertation. 6) Were there any challenges while conducting this research? How did you overcome them? The project demanded a wide combination of things: video recording, language training, field work, programming and writing. The work was fascinating but it was difficult to figure out how to turn all of these into a dissertation. Luckily, I had very good guidance from my supervisor and from many other people who read the texts, looked at the website and gave me feedback. 7) Were there any memorable moments? The PhD research was exhausting but also fun. I travelled to every city in Java where I knew of anyone who had done innovative work within the wayang tradition. People often welcomed my curiosity; they happily answered my questions and allowed me to record their performances. I was often invited to share food and tea with many great artists, including not only the dalang but also film directors, writers, musicians and visual artists. My fondest memories of the PhD research are the conversations I had with people such as Sujiwo Tejo, Eko Nugroho, Enthus Susmono, Nano Riantiarno and the late Slamet Gundono. 8) Has your research findings influenced your lectures or your career? Yes, I think this project has influenced the way I think about teaching and research. I try to encourage my students to do fieldwork and to learn how to use computational tools in their research. The research findings have also led to publications in different academic journals, both in theatre and in Digital Humanities. 9) Do you intend to further your research? Definitely. For the PhD I tried to keep a narrow focus on contemporary wayang. But I also realized there are many other areas of Indonesian performance worthy of attention, and many ways in which digital tools can help further the study of theatre. I hope I can continue to explore these things through research and teaching. 10) What are your plans (career or research wise)? I am working on a book project about the methodological implications of computational research methods for the study of theatre. I hope to continue learning about theatre (especially in Indonesia), teaching, and collaborating with people from different disciplines.